Home » ios » How to convert to play DVD on new iPad 3/4 or iPad mini? The Long-awaited third generation of iPad was finally unviewed by Apple's NEW CEO Tim Cook a March 7, 2012 with a fresh name "The new iPad". The new iPad 3 excited lots of Apple fans with Retina Display features which supports full touch screen HD display with screen resolution of 2048 x 1536; advanced quad-core ARM Cortex-A5X design processor empowering the new iPad as powerful as any top-end desktop or laptop; significant update to iOS to iOS 5.1 and long-life battery life. It's pity however, there is still no advances regarding video format support. New iPad 3 still can only support video format in MP4, MOV, and M4V. DVD disc still is not supported to be played on new iPad. Is there no way to watch DVD movies on the big, beautiful display, high-resolution 9.7 inches new iPad? Actually, playing DVD on new iPad 3 with high quality is that easy as long as you own Bigasoft VOB to new iPad 3 Converter. This article introduces an applied way to play DVD on new iPad 4, iPad 3 or iPad mini. By converting DVD to new iPad compatible video MPEG-4 or H.264 MPEG-4, you can freely play DVD movies on new iPad 3/4 or iPad mini with high quality on the go wherever you are and whenever you want. Make Preparation: Make Preparation Free Download Bigasoft VOB to iPad Converter. 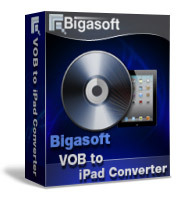 Free download Bigasoft VOB to new iPad Converter - Bigasoft VOB to iPad Converter (for Windows, for Mac). Install and launch it. Converting DVD might be a terrible experience if your go for crappy and buggy DVD converter. It is totally a waste of time and drive you sick as you spend hours trying to convert a DVD only to find it won't play on your device. Bigasoft VOB to new iPad Converter is simple, cost-effective, blisteringly quick VOB converter for new iPad. It can fast convert High-Definition (HD) DVD to Apple new iPad compatible video MP4, MOV, H.264 and audio MP3, M4A with amazing quality. You can easily select target subtitle and audio track, customize file size, rip only wanted movie clip, convert entitle DVD disc into one complete movie file, crop video to remove black bars and more. Bigasoft VOB to the new iPad Converter is fully compatible with Windows 7, Windows XP, Windows Vista, and Windows 2000 as well as Mac OS X Lion, Snow Leopard, Tiger, and Leopard etc. Insert the DVD disc into the DVD drive. Click on "Open DVD" button to import DVD to Bigasoft VOB to new iPad Converter. By default, DVD to new iPad 3 Converter set output profile as iPad Video MPEG-4. If you see the output profile is not iPad Video MPEG-4(*.mp4), you can click "Profile" drop download to select the profile as iPad Video MPEG-4(*.mp4). Merge in to one: DVD to new iPad Converter allows to convert DVDs into completed one file instead of many chapters. Check the option "Merge into One" if you want to convert DVD to a complete video file. Audio Track: By default, DVD to new iPad Converter set English as the audio track, if you want to use audio track in other language, click the "Audio Track" drop-down and set the desired audio track. Subtitle: By default, DVD to new iPad 3 Converter disable subtitle for output video. You can click the "Subtitle" drop-down and set which subtitle to be shown on output video. Trim video: Trim function helps you to throw the unwanted part and keep the most excellent segment. Crop video: Crop function helps to remove black bars of video or focus certain video area. Click on "Start" at the bottom of the interface to start converting DVD to new iPad 3 MPEG-4 video. After conversion is finished, click on "Open Folder" to locate the output video and drag to iTunes for transfer to new iPad 3. Now you can watch favorite DVD on new iPad. Playing DVD on new iPad 3, iPad 4 or iPad mini is just so easy.